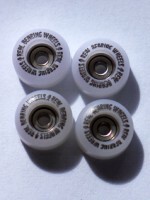 Those 4 light white bearing wheels are perfectly molded, so slick and smooth. Your fingerboard will roll professionally! Those 4 black bearing wheels are perfectly molded, so slick and smooth. Your fingerboard will roll professionally!